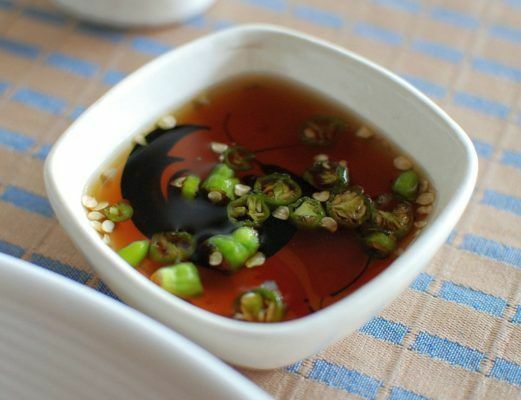 A condiment that is essential to Southeast Asian cuisines, fish sauce, also known under its Vietnamese name nuoc-mâm and its Thai name nam pla, is obtained from tiny fish that are steeped in brine (15kg of salt for 100kg of fish) and left to marinate in the sun for 12 months in jars or wooden barrels. The variety and quality of the final product depends on the choice of the basic ingredients: you have sauces made from squid or a combination of fish, but the most popular one is made uniquely from anchovies. In Asiatic cuisines, fish sauce is used as a tasty and salty seasoning in cooking (just a few teaspoons are enough) or as an accompaniment at the table (by adding some water, lemon juice, sugar, garlic, ginger, etc.). It is commercially sold in glass bottles and can be found in the Asian food section in almost all grocery stores. It lasts practically forever at room temperature but make sure you don’t break the bottle, because it doesn’t smell that great! In ancient times, people used to consume a similar ingredient called garos in Greek and garum in Latin. This was made from the flesh or viscera of fish or oysters that had been fermented for a long time in a large amount of salt. In 2008, archaeologists used garum found in an ancient factory at Pompei to confirm the month – August – of the famous eruption of Vesuvius in the year 79. This product was made entirely from bogue, a fish that is caught in summer. Originally published in the Journal de Montréal on March 19, 2011.